No matter what team’s jersey we have hanging in the closet, which NHL logo we have displayed on our car windows, and whose playing schedule makes up the wallpaper to our cell phones, we are all hockey fans. Sure, we may yell and scream at each other during games, taunt each other on Twitter, and honk at each other on the freeways, but when it all comes down to it, the hockey faithful are a brethren, and certainly every honored member would agree with that. A couple weeks ago, a small group of LA Kings fans demonstrated this brotherhood when they all pitched in to buy an Anaheim Ducks jersey for a Ducks fan they felt had been unjustly mistreated by some individuals cheering for the Kings when they played the Ducks at Honda Center in December. 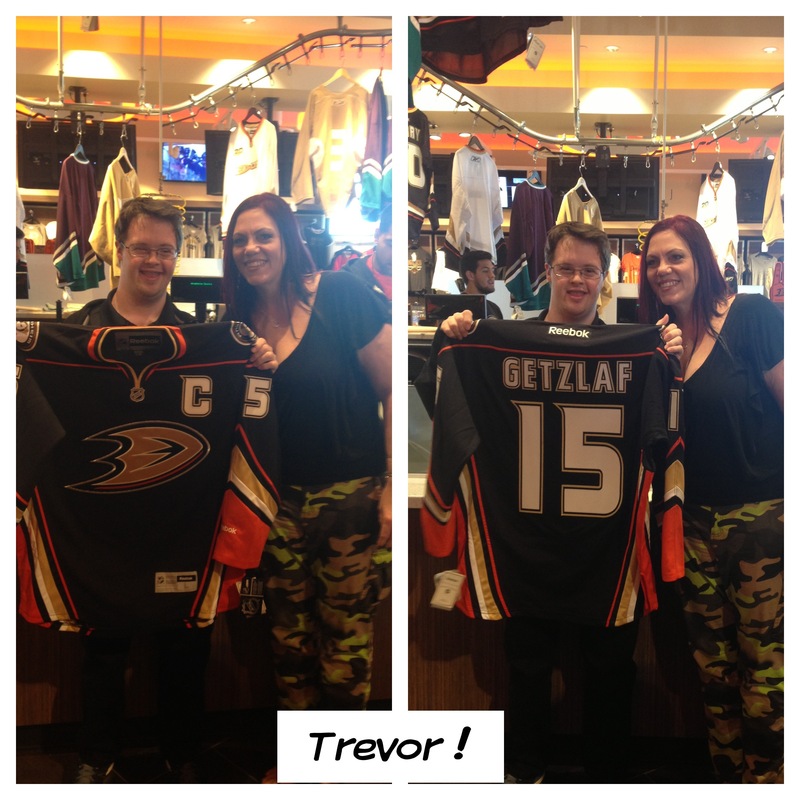 Trevor Hendershot, who has Down’s syndrome, is the greeter at the Anaheim Ducks team store. Hendershot is a popular fixture in Orange County as he also works at Angel Stadium of Anaheim. In his early 20s, Hendershot is always seen high-fiving fans, including those of an opponent. As social media has it, Hendershot was unknowingly verbally harassed by people in Kings attire, which didn’t go over well with Ducks fans who were witness to the unfortunate event. News of this occurrence made way to the Knights of the Forum, a private Facebook page dedicated to die-hard Kings fans. Some of the members of the page decided that such heinous behavior was not an appropriate representation of the LA Kings and their fans, and wanted to make it right, despite having no connection with the actual event, or either party involved. Missy Danner, a Kings season seat holder for the past 10 years, is one of the Knights of the Forum members who helped plan the gifted jersey. She has a 17 year-old son with Autism, and could relate to the situation. After an open discussion, the group decided a Ducks jersey would be appropriate, and a PayPal account was immediately set up so that money could be collected. A few months later, nearly $300 was raised, and Danner contacted the Ducks Team Store to place the order for a Ryan Getzlaf Stadium Series jersey. She arranged to pick up the jersey and hand it off to Hendershot on April 4, with the help of Jody Griffin, the team store supervisor. When Hendershot arrived to work just prior to the Ducks taking on the Nashville Predators, one of his supervisors walked him over to Missy, who handed him the jersey. “All I said was ‘there’s a group of Kings fans who thought he was awesome and we wanted to do something for him, so we thought a jersey would be good,’” recalled Danner. Hendershot was delightfully surprised and immediately asked for permission to wear the jersey. Fully aware that Hendershot had no idea what he did to deserve such a gift from complete strangers, the mission of Danner and the other supporting members from Knights of the Forum had been accomplished. Shortly after, Missy posted photos of her, Trevor, and the jersey on her Twitter account, and also posted a photo of the receipt so that the other Knights of the Forum contributors could see what their money had earned them. Of course, the photo went viral. “I didn’t think it was going to get this kind of attention. The picture was really just so that everybody knew – I posted a picture of the receipt so they knew how much it came to,” Danner explained. There is some leftover money from the collection, and Danner has already begun an effort to donate it to the Kings Care Foundation. This is the kind of thing that makes us all proud to be united by the sport of hockey, but Danner and her Knights aren’t even done there. Their next step is to get Hendershot’s jersey signed by Getzlaf himself. Ryan Getzlaf, are you reading this?? ?